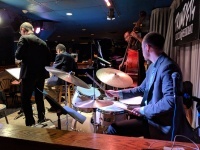 Claudio Roditi Quartet at Jazz Forum July 2018. Misha's album "​​​​​​Dreaming with eyes wide awake" ​with Hendrik Meurkens, Glauco Lima, and Michal Jaros. Maestro Maurice Peress conducting the Queens College Orchestra in New York City. Piece "Harlem" Duke Ellington. With the Grammy Awarded singer Alcione, USA Tour 2017. Song "Meu Ébano". Stage view. With singer Eleanor Dubinsky - Wesley Amorim, Rolando Semedo, and Vitor Goncalves.